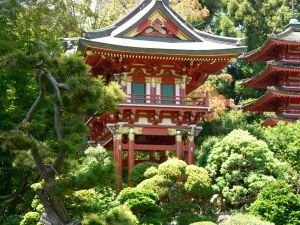 One of my favorite gardens is the Japanese Tea Garden in Golden Gate Park. We visited San Franciso in 2001, and were city weary and slightly stressed after several days of sightseeing downtown. We took the long bus ride out to the Park and spent a lovely afternoon wandering the quiet, cool gardens. It was an oasis of peace in our holiday. In Japanese culture, a garden is considered one of the highest art forms, expressing in a limited space the essence of nature through the use of specially selected plants and stones. Japanese legend attests that stones are actual beings with spirits that need to be treated with reverence.